SCVHistory.com LW3490 | Film-Arts | Paul Koslo Co-stars in ''The Omega Man'' (Warner Bros. 1971). 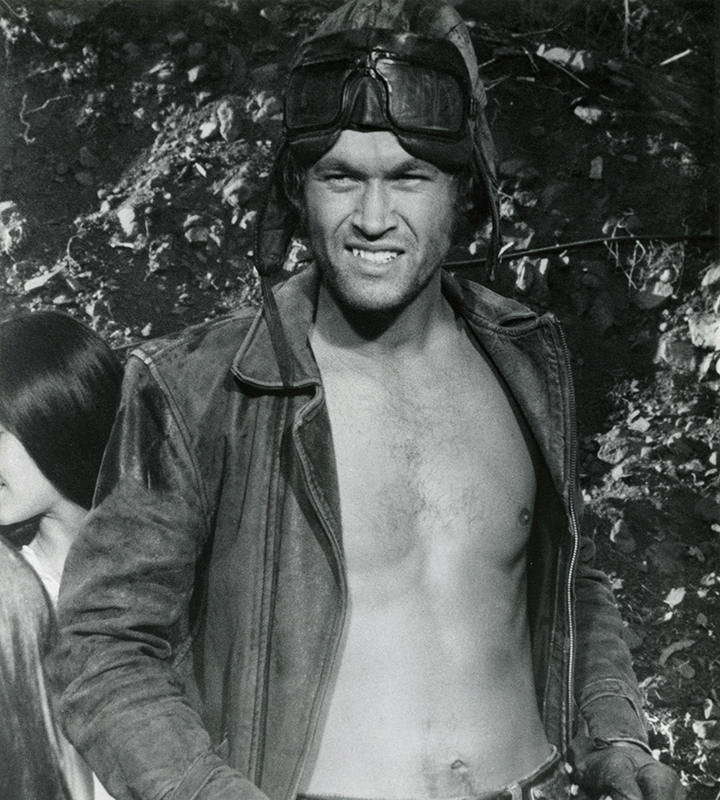 Paul Koslo in "The Omega Man"
Actor and Lake Hughes resident Paul Koslo co-stars as "Dutch" in the 1971 sci-fi thriller from Warner Bros., "The Omega Man," with Charlton Heston, Anthony Zerbe and Rosalind Cash. Koslo owned The Rock Inn, 17539 Elizabeth Lake Road, from 1975 until his death in January 2019. A job as a gas pump jockey tided Paul Koslo over until Hollywood gave him the nod. In his fifth important assignment in less than a year, he's co-starring with Charlton Heston in Warner Bros.' science-fiction drama, "The Omega Man," story of a biological holocaust in which most of the earth's population is killed. Heston's character, an army doctor, is tasked with developing a cure. At one point, Koslo's character, a biker and former medical student, saves Heston's character from from being burned at the stake in Dodger Stadium by a band of hooded, nocturnal albino mutants. During filming, Koslo accidentally hit Heston in the head with a gun, drawing blood. LW3490: 9600 dpi jpeg from original photograph purchased 2019 by Leon Worden.